Renal damage is a progressive complication of sickle cell disease (SCD). Microalbuminuria is common in children with SCD, while a smaller number of children have more severe renal manifestations necessitating kidney biopsy. There is limited information on renal biopsy findings in children with SCD and subsequent management and outcome. 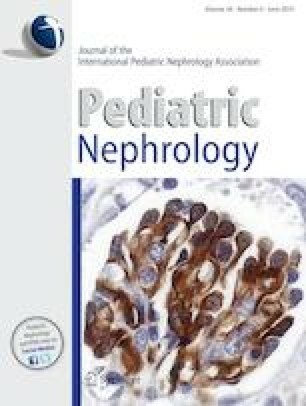 This is a multicenter retrospective analysis of renal biopsy findings and clinical outcomes in children and adolescents with SCD. We included children and adolescents (age ≤ 20 years) with SCD who had a kidney biopsy performed at a pediatric nephrology unit. The clinical indication for biopsy, biopsy findings, subsequent treatments, and outcomes were analyzed. Thirty-six SCD patients (ages 4–19 years) were identified from 14 centers with a median follow-up of 2.6 years (0.4–10.4 years). The indications for biopsy were proteinuria (92%) and elevated creatinine (30%). All biopsies had abnormal findings, including mesangial hypercellularity (75%), focal segmental glomerulosclerosis (30%), membranoproliferative glomerulonephritis (16%), and thrombotic microangiopathy (2%). There was increased use of hydroxyurea, angiotensin-converting-enzyme inhibitors, and angiotensin receptor blockers following renal biopsy. At last follow-up, 3 patients were deceased, 2 developed insulin-dependent diabetes mellitus, 6 initiated chronic hemodialysis, 1 received a bone marrow transplant, and 1 received a kidney transplant. Renal biopsies, while not commonly performed in children with SCD, were universally abnormal. Outcomes were poor in this cohort of patients despite a variety of post-biopsy interventions. Effective early intervention to prevent chronic kidney disease (CKD) is needed to reduce morbidity and mortality in children with SCD. Each of the 14 pediatric nephrology centers received approval from their local Institutional Review Boards for this retrospective study.